The New Jersey State Appeals Court recently ruled that texting someone while that person is driving may cause the sender to be liable if an accident occurs. Supporting arguments say those texting drivers are “virtually present” at the accident. This potential liability affects the distribution of responsibility amongst drivers when a collision occurs. 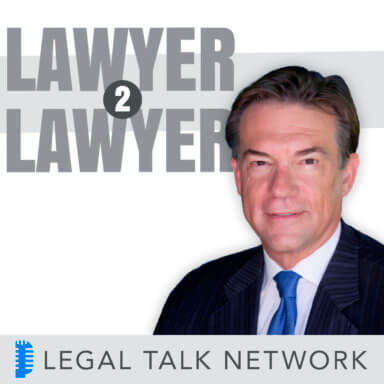 On this edition of Lawyer2Lawyer, your hosts Bob Ambrogi and J. Craig Williams invite Attorneys Ted Frank and Marc Saperstein to the discuss the case ruling, whether this advisory ruling will effectively prevent distracted driving, if it’s a fair allocation of responsibility, and more. • New Jersey Attorney Marc Saperstein is a founding member of Davis, Saperstein, and Salomon, P.C. and a part of the New Jersey Association for Justice. He regularly lectures to fellow lawyers on current case law, class actions, and injury law. Saperstein has a special interest in distracted driving education and prevention. • Attorney Ted Frank is an adjunct fellow with the Manhattan Institute’s Center for Legal Policy and the founder and president of the Center for Class Action Fairness. He has written for law reviews, The Washington Post, The Wall Street Journal, and The American Spectator. Frank is also on the executive committee of the Federalist Society Litigation Practice Group. Thanks to our sponsor, Clio.